There is so much confusing and contradictory information out there about healthy eating. Our food choices can affect not only on our body shape and quality of life, but also mortality and on how well we age. The components of whole food. Foods are made up of many different components—some are “micro” or smaller quantity nutrients, like vitamins, and some are “macro” or larger quantity nutrients. The three macro groups that compose the majority of our diets are carbohydrates, proteins, and fats. These three units are the basic materials that fuel our activities and metabolism and maintain body composition. Selecting the best sources and amounts of these three macronutrients may help to minimize metabolic disorders (such as high cholesterol and blood sugar) and prevent loss of lean body mass and accumulation of body fat. Carbohydrates provide our body’s main source of quick energy. After carbohydrates are digested and after some processing by the liver, they are released into the bloodstream as a sugar called glucose to be delivered to the cells. It was only after the advent of agriculture that human beings were introduced to higher intakes of grains as carbohydrate sources. Higher intakes of grains deliver lots of calories. Additionally, some grains deliver their sugar energy relatively quickly, especially if the grain is milled (which removes the fiber that slows down sugar absorption), as are the grains in breads and pasta. Unless you are very active and exercise enough to metabolize nutrients more rapidly, this quick glucose release into the bloodstream can create a dysfunctional hormonal environment that can ultimately promote obesity, cardiovascular disease, and diabetes. This hormonal shift also has a profound effect on lean body mass and fat metabolism, and possibly immune function. The key hormone involved in this problem is called insulin, produced by an organ called the pancreas. The hormone insulin is produced by the pancreas to control blood sugar and store it in muscles for later use as glycogen. Insulin’s main job in the body is to promote the delivery of sugar energy as glucose to cells. When a small amount of glucose is delivered into the bloodstream, a small amount of insulin is produced by the pancreas to accompany it. When there is a large amount of glucose, the pancreas works to produce a large amount of insulin to facilitate its delivery so that cells can take in as much glucose as possible. Extra glucose that cannot be taken in by the cells circulates in the bloodstream and can be toxic to brain cells, so under normal circumstances, most of it is soon converted into triglycerides (fat) in the liver to be stored for later use. But we have to be careful with high blood levels of triglycerides, since they are what feed fat cells. The correct amount of carbohydrate sources will provide enough sugar to give a healthy amount of glucose to the cells, but not too much at once. Thus, levels of glucose and insulin in the bloodstream are not unusually elevated for any long period of time. The pancreas works, but it is not overworked trying to keep up with an unusual demand for insulin. However, in the U.S., much of the diet consists not only of large amounts of high-calorie carbohydrate sources, but also of carbohydrates from sweets and sodas, which are very concentrated sources of sugar. The net effect that intake of these calorie-dense carbohydrate foods creates is a bloodstream that is occasionally flooded with large amounts of glucose, a pancreas that is overworked, and large amounts of insulin and triglycerides circulating in the bloodstream. Note that excess insulin causes increased production of cholesterol. Over time, these occasional glucose, triglyceride, and insulin floods can cause a decrease in the sensitivity of the cells’ response to insulin, which reduces the cells’ ability to take in glucose. Insensitivity to insulin is called insulin resistance, and it is a serious consideration in metabolic problems. Some HIV medications can worsen insulin resistance, so we need to be aware of nutritional considerations that can help. Ways to decrease insulin resistance are to exercise, follow a proper diet, and taking medications that improve insulin response. For instance, several studies have found that people consuming an overall high-quality diet, rich in fiber and adequate in energy and protein, were less likely to gain fat. This is why it is best to select the majority of your carbohydrate intake from fiber-rich, slow-releasing carbohydrate sources that do not contain an excessive amount of calories. And these good carbs should be accompanied by good sources of protein and fats. Combining carbohydrates with protein, fiber, and fat. Protein, fiber, or fat will slow the absorption into the blood of glucose from carbohydrates, which helps to reduce the rise in blood sugar and insulin spikes. So, mixing carbohydrates with protein, fiber, and good fats is one way to reduce their problematic effect on blood sugar and insulin. Ensure that every meal and snack you consume has a mix of these three macronutrients. But what are the best fats, protein, and high-fiber carbohydrates sources out there? There are a number of different kinds of fats. There is motor oil, there is butter, and there are essential fatty acids. The most important oil to keep a Honda running right is not the kind with essential fatty acids (EFAs), but if you want to help your body stay healthy and your immune system operating at its best, you had better consider getting these EFAs on a daily basis. They are called “essential” because your body cannot manufacture them, and must obtain them from an outside source, like food or supplements. These oils are necessary for every critical function in your metabolism, including building lean body mass and fighting infections. The main point is that since we need EFAs and other fats for health, we should be getting them in our diets from fresh, high-quality sources. A proper diet reduces the amount of starchy carbohydrates while maintaining a certain amount of healthy fats so that there is a different macronutrient balance than the old high-carbohydrate, high-protein, low-fat diets contained. This means striving to get fatty acids from several sources, the least of which are the saturated fats in butter or animal fat. Understand that saturated fats are not the demons we have been led to believe. When we realize that we evolved getting a certain amount of saturated fat from foods in the wild, it is only logical that they would have a place in a healthy diet. One recent study showed that dietary saturated fat and mono-unsaturated fat were associated with healthy testosterone production in humans, while EFAs had no effect. So it appears that we need a little saturated fat for optimal hormonal health. However, most people get far too much saturated fat, which promotes insulin resistance and metabolic problems, and not enough EFAs, which are needed for healthy cells and immune function. The other important kind of fat that we should consciously include in our daily diet is mono-unsaturated fat, which we get from foods like olive oil. Recent data have shown that mono-unsaturated fats decrease the risk of certain cancers, and have an anti-inflammatory effect. EFAs include the omega-3 and omega-6 fatty acids. Most people get an imbalance of these two by consuming too small an amount of omega-3 fats, which have anti-inflammatory properties, and relatively too large an amount of omega-6 fats, which tend to promote inflammation when out of balance. To get more omega-3s, eat more fish, including salmon, tuna, sardines, anchovies, mackerel, rainbow trout, and herring. Omega-6s are contained in common vegetable oils, like sunflower, safflower, and corn oils. Try to reduce your intake of these. Olive oil is one of the best oils to cook with. You can also cook with high-oleic sunflower oil, avocado, canola, macadamia, or any oil that is high in mono-unsaturated fatty acids. Avoid cooking with oils made from corn and sesame. These oils contain more omega-6 fats, and less mono-unsaturated fats, so they have a higher potential for spoiling and turning to trans-fats, which are bad for the immune system. Try to avoid any intake of these oils when they are not absolutely fresh. Also, choose oils that are minimally processed. Most of the clear oils in supermarkets are stripped of some of their natural components to make them more suitable for sitting on store shelves for long periods of time without spoiling. Do not use these stripped oils. When you do cook, do not overheat the oil so that it smokes, which causes the formation of carcinogens and destroys the beneficial fatty acids. Avoid margarine, hydrogenated fats, or processed oils. Do your best to avoid processed fats or oils, as they have negative effects on cellular health, overall metabolism, and your immune system. Look out for the words hydrogenated and partially-hydrogenated. These kinds of manipulated fats probably do increase the risk of cancer and heart disease. They also weaken healthy cellular immune metabolism. Lastly, they are also likely to promote high lipid levels and insulin resistance. Protein, food for the immune system. Dairy protein fractions, such as caseine (contained in milk curd) and whey, are at the top of the list of proteins that optimally feed lean body mass growth. In dairy products, the amino acid balances, insulin-raising potential, and overall growth factor content add up to one thing: milk proteins were created to make mammals grow bigger. While there is a lot of hoopla related to which dairy protein fractions are best, there is more misinformation than reality in this area. Those with lactose intolerance should be careful in their selection of milk-based products. Aged cheeses and yogurt may be more tolerable for those who cannot digest lactose. Next on the list are egg proteins. The important thing to remember is that whole egg is probably somewhat better than egg white for lean body mass growth and overall health effect, because the yolk is a rich nutrient source, and its protein content complements the protein in the egg white. Together they are a better source of protein. While real food like meat often seems to take a back seat to protein powders because of a mindset created by slick advertising, professional athletes know the value of real food related to lean body mass growth. If you do not make real food and meat fundamentals in your diet, you will not grow lean body mass tissue as well. Fish, chicken, turkey, and beef are vitally important foods, not only because of their protein content, but because they contain numerous other nutritional components that are important for a healthy metabolism. The message is: eat real food, then supplement food with protein powder drinks if you need them. Lean red meat is a superior source for lean body mass growth and blood-building nutrients. These include creatine, carnitine, phenylalanine, conjugated linoleic acid (CLA), and heme- (blood) iron, the most absorbable form of iron. And meat, in general, is less likely to cause allergic reactions than eggs or dairy proteins, like casein and whey. The only caution about red meat is that the high amount of saturated fat most commercial red meat contains could promote metabolic problems. So be moderate about including it in your diet and choose leaner meats if you do. Important details on meat: cooking kills bacteria in meats. Stewed meat is better for digestion (chicken soup, beef stew). Roasting is okay. Try not to fry or barbecue with charcoal. Charred foods are associated with increased risk of gastrointestinal system cancers. Any cooking of meat or vegetable protein that causes the formation of a hard outer skin renders the protein that becomes the skin to be much less digestible because it cross-links the protein. It is very difficult to gain lean muscle weight on a vegetarian diet. In fact, it is almost impossible for most people, especially when they are fighting infections that burn lean body. If you do choose a vegetarian diet, your best protein sources are beans, seeds and nuts. Digestion of nuts and seeds will be improved by soaking them overnight to reduce the enzymes they contain that inhibit digestion of proteins. If you can eat them without digestive problems, many nuts and seeds are ideal foods because they contain protein, healthy fat, and complex carbohydrates in a very good balance for overall health. They also make a great snack between meals. However, the amino acid balances in these proteins do not appear to be optimum for lean body mass growth for humans. We know that calcium and vitamin D help to strengthen bone. Many of us chose to take calcium plus vitamin D supplements, but there are also foods that are rich in these nutrients. Calcium-rich foods include milk, cheese, spinach, fortified orange juice (be careful with the sugar, though! ), fish, eggs, and beans. Vitamin D-rich foods include milk, most fish, and eggs. However, most of us do not consume the 1000 mg and 2000 IU needed per day for calcium and vitamin D, respectively, and need to take over-the-counter supplements. · For your food, shop mostly in the outer part of the grocery store where the fresh produce, meats, and milk products/eggs are. Avoid overly processed canned or packaged foods, except for frozen vegetables. Read the labels and avoid products with many preservatives and additives. Trans-fats and hydrogenated oils, high fructose corn syrup, and high sugar should be on your radar when reading labels. · Try to eat several smaller balanced (protein + good carbs + good fats) meals or snacks instead of two to three large ones. Smaller meals/snacks are more easily digestible, keep blood sugar and insulin more constant through the day, and keep you from binge eating late at night. · Eat more almonds, walnuts, pecans and pistachios (good cholesterol-lowering fats). Twice a day, snack on such nuts to get your good fats and fiber. If you wish, mix them with some dried fruit. Research has shown that people who eat nuts tend to have lower LDL cholesterol. · Avoid junk and fast food. The best way to do this is to have enough food at home and to bring lunch to work. Cook a lot of food on weekends and freeze meals in small containers you can heat up later. · Do not sabotage yourself by bringing sweets and junk into your home. Watch your cravings at night, when most people find it the most difficult to avoid over-drinking alcohol or eating ice cream, cookies, and comfort foods. · Eat a large breakfast, a moderate lunch, and a small dinner. Skipping breakfast makes you more prone to overcompensate by eating more calories late in the day. Your body has spent several hours without food and is starved for nutrients in the morning. Do not feed it sugar and white flour products at this important time. Eggs, oatmeal (the type that has no added sugar, and you can add whey protein powder to it! ), Greek-style yogurt with nuts and fiber supplements, low-fat cottage cheese with fruit, almond butter on multigrain (high-fiber) bread, and fruit are all good choices for breakfast. · For lunch have some soup and a glass of water first and wait 10 minutes to trick your body into feeling full faster. Grilled chicken with vegetables, tuna salad over greens and nuts, a Greek salad with sliced steak, and any Mediterranean food choices are good. · For dinner, fill yourself with stir-fried (use olive oil!) vegetables and lean meats. Two hours before bed, you can have half an almond butter sandwich or yogurt with fruit. You will not be hungry and desperate with this diet! · Eat fruits and vegetables of all colors. Each has a different antioxidant profile. The produce section of the market is basically a fresh vitamin department and a medicine chest. Some foods like garlic, onions, and ginger have genuine therapeutic effects. Eating the widest variety of fresh produce on a daily basis assures you of getting all the ingredients that nature provides that can help keep your body strong enough to handle bacteria and viruses so that you stay healthy. · Avoid sodas, sweet drinks, and fruit juices (fruit sounds healthy, but juice contains too much sugar and no fiber to slow down its absorption into the blood). Consuming sugar daily can affect your metabolism, create insulin resistance, make you fat, and have all kinds of negative health consequences. The suggested pecking order of carbohydrate food sources that support your health without increasing insulin resistance follows. Best are vegetables in their many forms. Next are beans and peas. These deliver more calories than vegetables, but the carbohydrates release much more slowly than grains. Next are whole grains, which are calorie-dense but contain carbohydrates that, in general, release somewhat slowly. At the bottom, and the most likely to promote body fat problems, are carbohydrates from milled grains, like wheat and corn. Whole grains are marginally better than processed grains, but when they are milled into flour the difference is not that great. The very worst carbohydrate sources are sweets, like candies, which can deliver as many as 2,000 calories per pound. Try to eat from the first group of slow-release carbohydrate sources most of the time, and if you are relatively healthy, you can have small amounts of milled wheat products or sweets once in awhile. · Drink lots of water. Six to eight glasses a day is a good goal. If you get thirsty, you are already dehydrated! 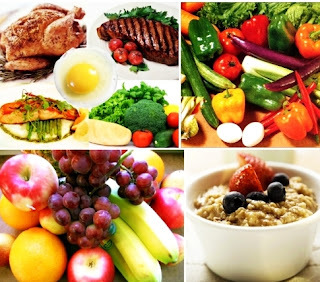 · Eat a high-protein, complex carbohydrate-rich meal after workouts. Examples: chicken salad with nuts, cottage cheese or yogurt and nuts/fruit, celery sticks and hummus (chickpea butter), etc. · Manage your intake of caffeine (it reduces appetite but can increase anxiety). Do not have any caffeine after 4 p.m., since it can impair your sleep. · Minimize hidden sugars like high fructose corn syrup. Read the labels of food you buy. Diet sodas tend to make your brain crave sweets in general, so they are not good substitutes for sugary drinks. Water, water, water! · If you do not consume at least 20 grams of fiber a day, add to your intake supplements like Citrucell or Benefiber, purchased in any grocery store. Fiber improves insulin sensitivity, makes you feel full longer, keeps your gut healthy (friendly gut bacteria that produce vitamins love fiber), keeps you regular and reduces diarrhea, and can lower the chances of getting colon cancer. · Eating healthy is eating smart, and it does not mean that you should starve yourself. Hopefully, this information has shed some light on healthy food sources and how they can affect health and the body. So, take charge of your health and take care of your body. It is the only one you have. · Whole fruits (remember no juices). -7am: 2 scrambled eggs, 2 oz of smoked salmon, 1/2 avocado, 1 small serving of berries. -7pm: 6oz steak, grilled/steamed asparagus, butter lettuce salad with Extra Virgin Olive Oil/Balsamic Vinegar dressing. -3pm: Healthy Snack (i.e, nuts/seeds, small serving of lean meat/ natural beef jerky) or whey protein. -7am: Sweet Potato with 2 Over Easy eggs and fruit. Or bowl of steel cut oatmeal with 2% Greek yogurt and nuts/berries. -12pm: 6 Wings (Baked) and 1/2 Turkey & Avocado salad. -3pm: Other half of salad from lunch or whey protein. -7pm (Cheat night) Go for it, although no dessert! -10am: nuts, cup of 2% fat Greek yogurt, or whey protein. -7pm: 6oz Filet with roasted veg (1 glass red wine). You can cheat a little. -1pm: Cheat meal. Go for it!! Carnitas (shredded pork) in butter lettuce wraps plus black rice or black beans. · Sweet potatoes, carrots, celery, & beets.